Hm.... what should I say ? It's supposed to be an express transfer from Phuket to the Phi Phi Islands by high speed ferry and the duration should be around 90 minutes. 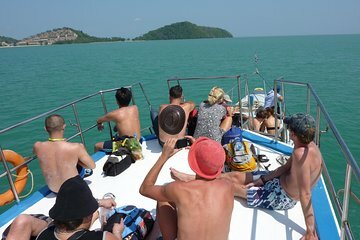 However, it turned out that the ferry was not a high speed one but a regular ferry which took 2 hours from Phuket to Tonsai Bay alone, excluding hotel pick up time. I wonder if I had got on a wrong ferry because there were many ferries at the pier. It was an enjoyable ride though, but not what I had expected in terms of speed.